Here are some facts about Sir Walter Raleigh. Walter Raleigh was an English aristocrat, writer and explorer. He is best known for establishing an early colony in the New World and for bringing tobacco back to England. Raleigh is also known for his chivalry. On one occasion he is said to have put his cloak on the ground so that the Queen Elizabeth I did not have to step in muddy puddles. He was born in Devon in about 1553, although little is known about his early life. Because he fought well in Ireland, Queen Elizabeth I trusted him with the colonizing of America. In 1580, Raleigh helped to stop a rebellion by the Irish, making him more popular with Queen Elizabeth. He was given a knighthood, making him Sir Walter Raleigh, and became rich and powerful. In 1587, he sent an expedition of colonists to Roanoke in present day North Carolina. The group mysteriously disappeared and to this day nobody knows what happened to them. 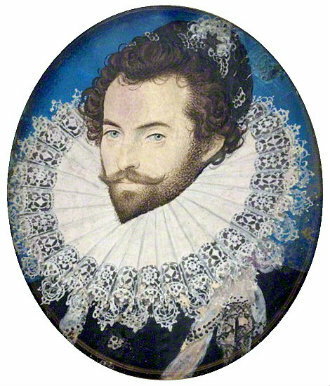 Although Sir Walter Raleigh did not play a very large role in repelling the Spanish Armada of 1588 (particularly when compared to the role played by Sir Francis Drake), he was a member of Elizabeth I’s war council, and worked hard to recruit troops and improve coastal defences. In 1591, the Queen was upset because Raleigh married one of her servant girls. However, she forgave him when one of his expeditions to Spain resulted in the capture of a large treasure trove. Walter Raleigh made two trips to South America in search of El Dorado, the legendary city of gold. Instead of gold, he found tobacco and potatoes. King James I distrusted Raleigh and sentenced him to life imprisonment in the Tower of London and later, to death. While there, he wrote a book about Ancient Rome and Greece. Sir Walter Raleigh was executed in London in October, 1618. His head was given to his wife who apparently kept it in a velvet bag until she died almost 30 years later. The state capital of North Carolina was named after him, in 1792. He has been portrayed in films and plays by Vincent Price, Richard Todd and Andy Griffith.